The Oulla Creek Fire Trail is located in Duea National Park west of Moruya in South Coast NSW. This is an excellent trail of about 40 km starting at close to sea level and climbing consistently to well over 700 meters along a ridgeline between the Duea River and its tributary, Oulla Creek. At times there steep drops on both sides affording excellent coastal, river and mountain views. 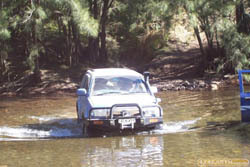 The 4wding is great also as there are two river crossings and plenty of low range action over often steep and rocky terrain.The short bitumen section heads west from Moruya along the Araluen Road (Campbell St), left into Wamban Rd (before the Duea River), right into Donalds Creek Rd, right again onto the dirt at GPS (-35.9255 149.9873) and then keep left until you reach Burra Creek GPS (-35.8985 149.9816) which has a large gravel area and a beautiful pool. Continue a little upstream to find the creek crossing from where the ascent of the Oulla Creek Fire Trail begins.For the 20 km which will take more than 2 hours the trail climbs relentlessly to the northwest with only occasional short descents after cresting peaks. There are many photo opportunities as well as plenty of wildlife in the cooler parts of the day. The navigation is quite simple as there is only one road (Knowles Crossing Fire Trail) on the right at GPS (-35.8321 149.9406). Continue climbing until the Merricumbene Fire Trail junction is reached where the right turn is taken. The next 5km sees the trail swing round to the east and pass Merricumbene trig at elevation 743 meters. It then descends to the Dry Creek Fire Trail junction where a right turn is made. After a further 5 km of steep descents with one intermediate climb and a final descent the Duea River is reached. Cross with care to the camping area or continue up the trail a short distance to the Araluen Road where this trip ends. Turn right here to return to Moruya.